So, as you may or may not have noticed, I changed the format of my blog a bit. Helen McSweeney of the incredible blog Tartelette helped me out a great deal, teaching me about photography and making my blog more accessible. Hopefully you all like it, so I would really appreciate some feedback. I recently took a trip up to Dartmouth to stay with a friend; while I was there, we spent some time with a family friend in the Vermont countryside. He and his wife made us a beautiful lunch, which they served with a cool glass of fresh apple cider. With my first sip came the strongest urge to bake; my friend Casey and I made a batch of pumpkin cupcakes in her dorm kitchen, but this was not enough to satisfy my desire. In my first free moments at home, I flipped through Room for Dessert, looking for something that would have complemented the crispness of the apple cider. I knew that I wanted something more substantial than a cookie or ice cream, something that could even be served at breakfast. I saw this gorgeous, caramelized cake and immediately knew it was perfect. Sadly, the cake was not as attractive as I had hoped. Despite its appearance, it was moist and flavorful and incredibly tasty. It would definitely be the perfect accompaniment to that glass of cider. Preheat oven to 350. Combine brown sugar and maple syrup in a 9-by-2-inch round cake pan. Set pan directly on stove and heat until mixture begins to bubble. Boil gently for 1 minute, stirring frequently. Remove from heat and set aside. Sprinkle walnuts over maple glaze in pan and press lightly. 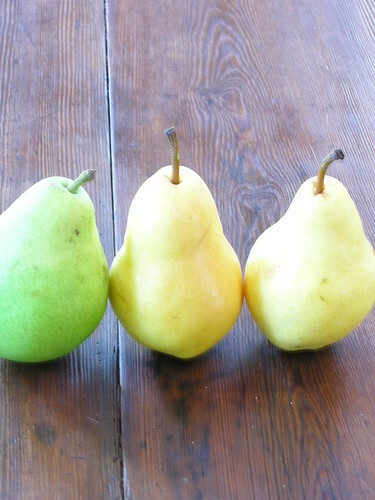 Arrange pear slices concentrically over walnuts, overlapping one another. Cream butter, sugar, and brown sugar. Add vanilla extract and eggs, one at a time. Whisk together flour, baking powder, cinnamon, and salt. Gradually beat into butter mixture in three additions, alternating with milk. 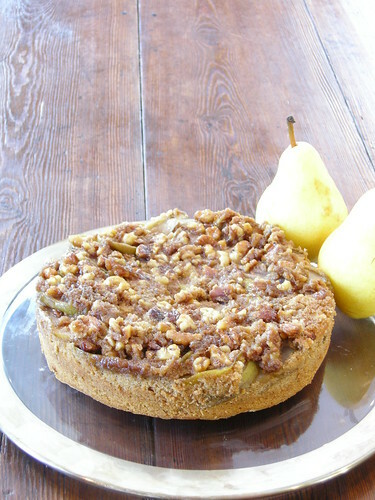 Transfer batter to cake pan, careful not to disturb pears. Bake for 50 minutes, or until a toothpick inserted in the center comes out clean. Cool for 30 minutes. Invert onto a cake plate and lift off pan. As usual, this dish looks absolutely delicious! i hope to taste this treat some day soon! I am so glad Friends helped you pass the time, and this sounds delicious!